My twentieth ground of 2016 was on Monday 17th October at Stubbs Lane in Binfield, Berkshire. 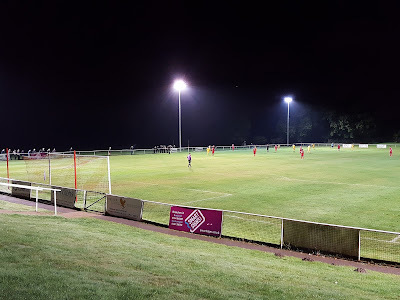 The match was Binfield vs. Flackwell Heath in the Hellenic League Premier Division. Stubbs Lane is located in countryside just to the north of the village of Binfield. The rural setting sees the ground mostly encompassed by fields with it being 2.5 miles north of the nearest railway station at Bracknell. The club have resided at Stubbs Lane since 1980. Most of the structures at the ground are behind the western goal - this begins with a flat level of concrete with large steep grass bank behind it. At the back of the grass bank is the building containing the clubhouse, changing rooms and food outlet and there is a larger covered flat concrete area with park benches either side of this building. The building itself will soon be renovated as the club are receiving funding of around £300,000 to make improvements to the venue. The only other structures at the ground are on the southern side of the pitch. This also has a flat section directly behind the barrier with a grass bank behind. 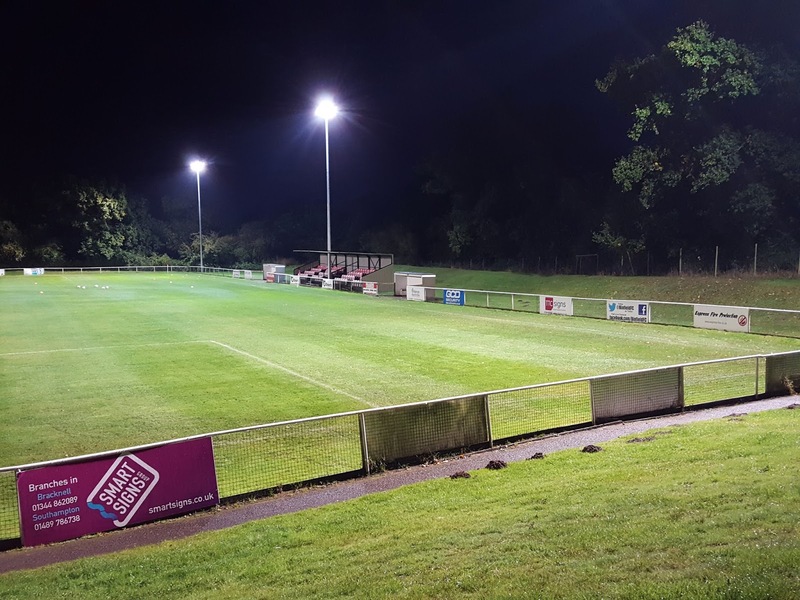 On the flat section there is an all-seater stand which has a total of 100 seats split into two sections of 50 with a floodlight going through the roof of the middle of the stand. The two dugouts are either side of this stand. The remainder of the ground is uncovered standing with a small grass bank behind the eastern goal and an additional pitch behind the standing area on the northern side of the pitch. Flackwell Heath raced out of the traps and were dominant in the opening period the game. 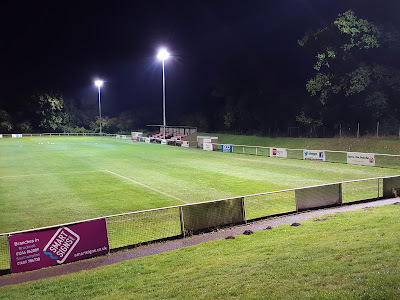 They took the lead in the 5th minute when Dan Bayliss mis-hit a cross from the left-wing and it looped over the keeper and snuck into the top corner of the net. The lead was almost doubled in the 10th minute when a shot from the edge of the box came back off the post. The visitors didn't have to wait too much longer though as in the 24th minute a long ball up broke to Matt Stockill who lifted an excellent shot into the top corner from 20 yards. Flackwell hit the woodwork again in the 40th minute when a free-kick into the box was flicked onto the underside of bar but the ball did not cross the line and was cleared. 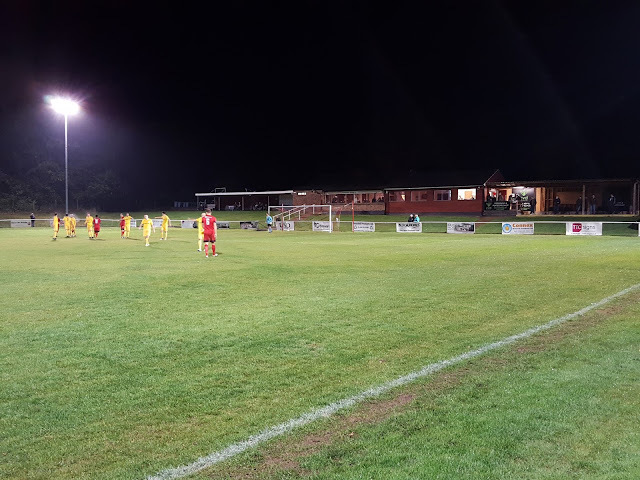 Just a minute later it was the first good opportunity for the hosts when the ball was slipped through to Grant Kemp who hit the post from 10 yards. 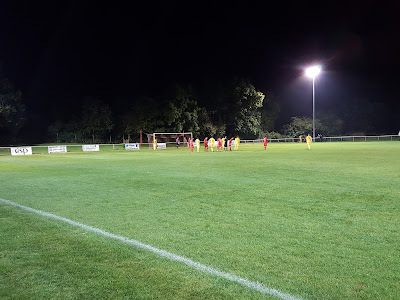 Flackwell went in 2-0 up at the break and went close to extending this a few minutes after the restart when a free-kick was drilled into box, bypassed everyone and came back off post. It was an improved performance from Binfield in the second 45 minutes as they made it a more even contest. However the final goal went to Flackwell a quarter of an hour from time - Matt Stockill played Adam Burnell in on goal and though his initial effort was palmed away by the advancing keeper he was able to pick the ball up and then spin and launch a shot over the keeper and defenders high into the net.